I think one of the biggest misconceptions out there for women is that you have to spend your life on some type of cardio machine to get in shape. Unfortunately what’s really happening in spending countless hours on the machine, is that it yields slow results and frustration. So what should women really be doing? If you paid attention to the title, weights!!! Doing cardio is great for your heart but it builds very little muscle which is what you need in order to burn fat and calories all the time. It’s not a fair world as we all know and guys will always have more muscle on their bodies than women do. And don’t worry about getting too big, you don’t have enough testosterone to get muscles like a guy in most cases. Unless you’re that really big German woman named Helga who uses steroids on a daily basis. So women should really be focusing more on weight training and heavier lifting than on cardiovascular exercises. Think about it this way, weight training physically builds muscle on your body. That muscle intern will burn calories 24/7. That is why guys can get away with sitting on the couch watching TV and still have a better physique. Because remember it is not about weight, that is only a gauge and muscle tissue weighs more than fat tissue!!! So the difference between 150 pound woman and a 150 pound man as far as physical appearance is probably fairly drastic in most cases. So all you women out there need to stop being so afraid of the barbell and try to stay away from machines, all they do is hurt you because they confine your movements and make them unnatural. Can you do a one legged squat? Can you actually do 10 real push-ups? If not start out by doing squats while you brush your teeth. Do heel raises/calf raises as you stand at your desk….yes I said stand, get off of your behind and stop sitting around. So there you go, hit some weights 60% of the time and do cardio the other 40%. Two very simple and effective exercises everybody can do are push-ups and squats. Throw some core exercises like planks in and you have a pretty decent work out. Then my favorite saying by an unknown author “you will never out exercise your diet”!!! If the food has more than one ingredient listed on the label and you can’t read the other words it is Frankenfood and you need to find a better choice. Have fun and feel great! 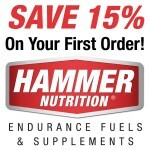 Use some Hammer Nutrition to recover and not be sore!